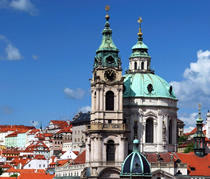 There are three St. Nicholas churches in Prague. Construction of St. Nicholas Church (Kostel sv. Mikuláše) in the Lesser Town began in 1703 on the site of a former parish church, the records for which date back to 1283. St. Nicholas Church lies at the centre of the Lesser Town Square and is the largest of Prague's churches founded by the Jesuits. The church is the masterpiece of Christoph and Kilian Ignaz Dientzenhofer, a father and son duo who constructed many buildings during the Baroque period. Unfortunately, neither lived to see its completion. The building was finished by Kilian's son-in-law, Anselmo Lurago. The interior of St. Nicholas Church is decorated with statues, paintings and frescoes by leading artists of the day. Particularly impressive is a fresco of the Celebration of the Holy Trinity by Franz Palko, which fills the 70m high dome. Over the Baroque organ is a fresco of St. Cecilia, patron saint of music. The organs were played by Mozart in 1787. The belfry tower was the last part of St. Nicholas to be built, constructed by Anselmo Lurago in 1751-55, and is as tall as the dome of the church. Visitors can climb the tower to experience good views over the Lesser Town and across the Vltava River to the Old Town. The gallery is 65m high and there are 215 steps. Admission to climb the belfry tower.